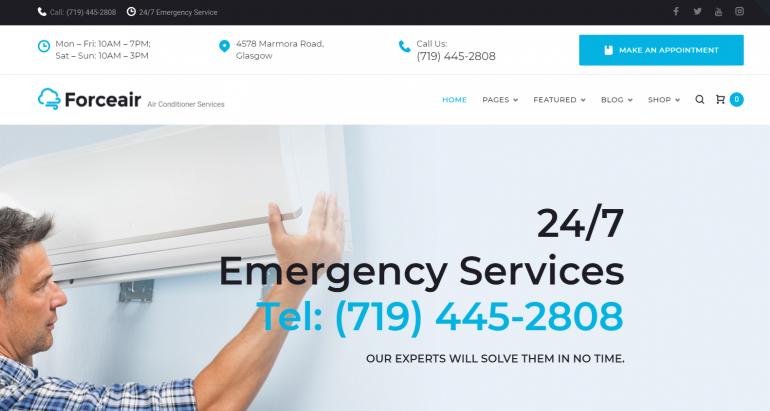 WordPress is an excellent website option for an HVAC company, but sometimes it's hard to get all of the features you need. That's where the themes on this page come in. 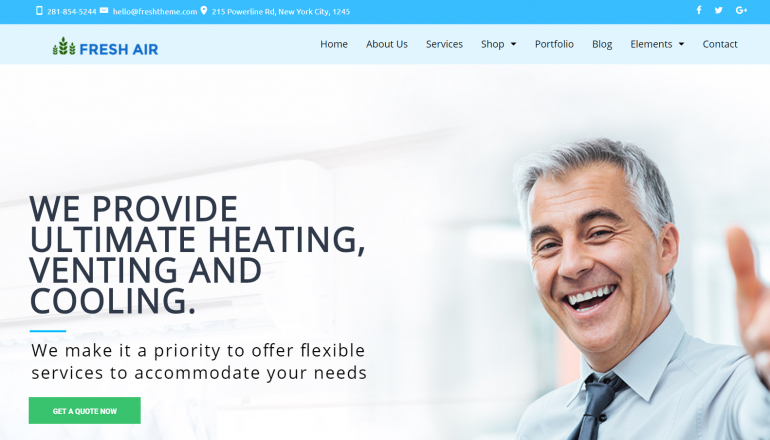 Below, we review 10 different themes that are perfect for an HVAC website. 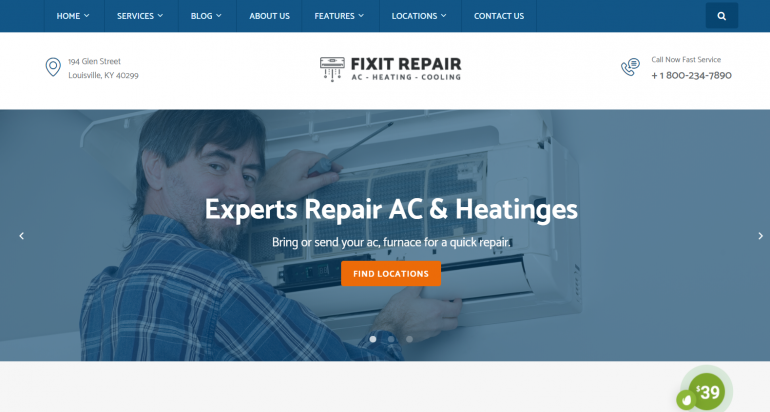 For this roundup, we looked for themes that include all of the important functionality of an HVAC site. That includes a booking/calendar engine, pages for services and testimonials, contact forms, and plenty of customizability. Airpro is our favorite theme on this list, and is sold by Themeforest. In addition to being well designed, Airpro is completely designed around the needs of an HVAC company, and includes a booking and scheduling engine, all kinds of plugins, and plenty of cool features. Examples: a warranty card generator, 2 sliders, a calendar, and a complete page builder. It also includes plugins, has many customization options, is SEO optimized, has a drag and drop builder, supports WooCommerce, offers free suppport, and includes multiple layouts. Although it is has many options, making configuration complicated, we like Airpro due to the fact that it is alluring, and among users, it's one of the top reviewed themes on Themeforest. There's no doubt it will be a great addition to your website. 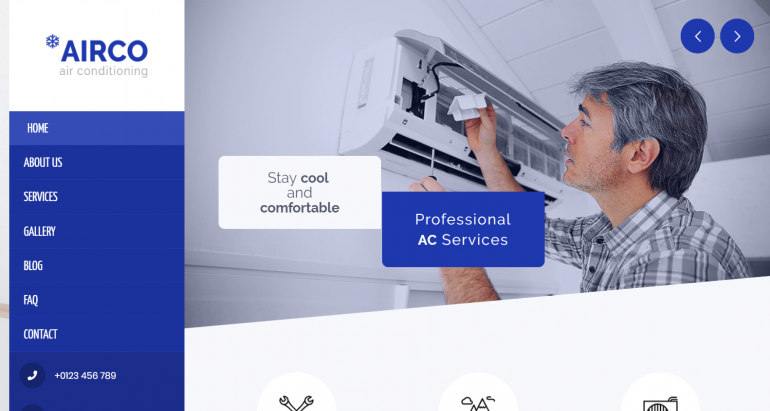 Air Conditioner and HVAC is a specialized theme for HVAC professionals by Themeforest. In addition to being asthetically pleasing, Air Conditioner and HVAC is one of our favorite themes because it is built for the HVAC business out of the box. It includes a scheduling engine, all of the pages and widgets you need, and a complete drag and drop page builder. Air Conditioner and HVAC has a large user base, so it is simple to get help and support. 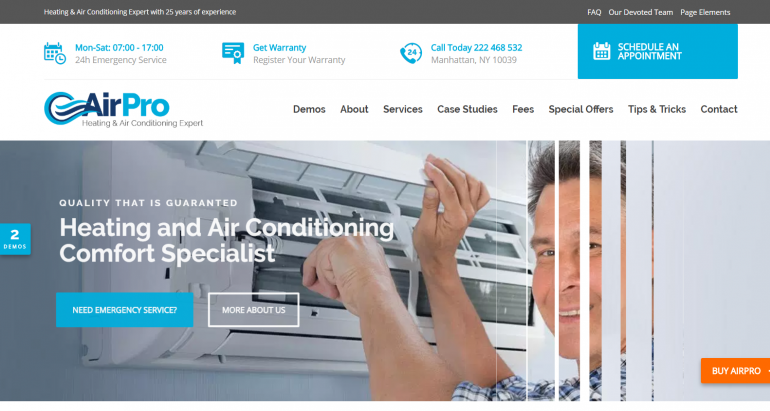 Included with Air Conditioner and HVAC are plugins, customization options, SEO optimization, a drag and drop builder, WooCommerce support, icons, fonts, custom widgets, and demos. Air Conditioner and HVAC is mobile and iPad friendly. It is also multilingual. 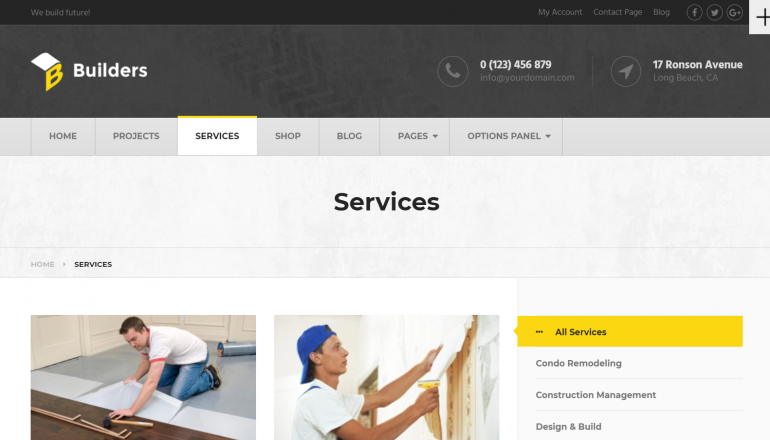 Builders is a contemporary theme that can be used by any type of contractor from MyThemeShop. It supports Adsense, is SEO optimized, supports WooCommerce, has a 1-click install process, offers multiple color choices, is skinable, and offers free suppport. Builders is a perfectly suited for a HVAC company because it includes all of the components you need, including scheduling, services, and a gallery of testimonials. This theme is a breeze to install and a snap to use. Included with this theme are icons, background images, fonts, a slider plugin, custom widgets, AJAX functionality, Retina images, and demos. 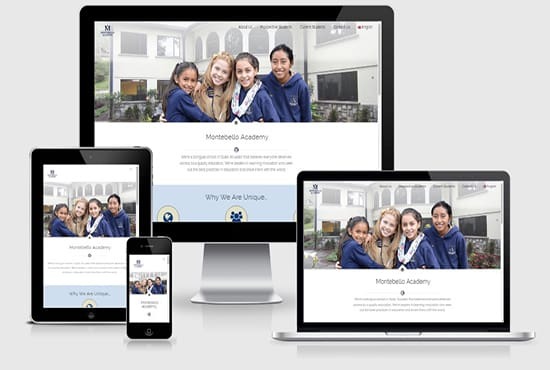 Builders is mobile and tablet friendly. 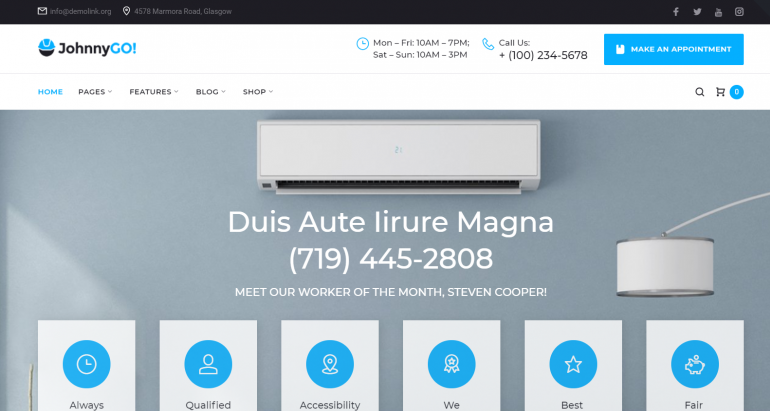 Airco is a visually appealing theme for air conditioning/HVAC companies created by TemplateMonster. In addition to being gorgeous looking, Airco is one of our favorite themes because it includes plugins, has many customization options, is SEO optimized, has a drag and drop builder, has a 1-click install process, and is skinable. Airco is a well suited for a HVAC company because it has a built in contact form engine for scheduling, services pages, a gallery, a blog, and more. This theme is easy to install, but it can take experience to fully master. Included with Airco are icons, background images, fonts, a slider plugin, custom widgets, Retina images, and demos. Airco works well on tablets and mobile devices.. Although it is not free, we like Airco because it is elegant, and among users, it's very highly reviewed. We're certain it'll be a great complement to your HVAC website. Air Conditioning is a more basic air conditioning theme offered by TemplateMonster. Air Conditioning supports Adsense, has many customization options, is SEO optimized, has a drag and drop builder, has a 1-click install process, offers multiple color choices, and includes multiple layouts. It also includes all of the components you need for your HVAC website, including scheduling, services, and a gallery of testimonials. This theme is easy to configure although it may take some usage to completely understand. Additional stuff included with this theme are icons, fonts, custom widgets, and demos. Air Conditioning looks great on mobile. It is also multilingual. Although it is not free, we love this theme because it is high quality. We're certain it'll be a great addition to your website. ForceAir is a clean theme for A/C specialists provided by TemplateMonster. In addition to being uncluttered, ForceAir is one of our favorite themes because it includes plugins, is SEO optimized, has a 1-click install process, offers multiple color choices, and has multiple layouts. ForceAir is a well suited for an HVAC company because it includes all of the components you need, including a complete scheduling and appointment engine, as well as pages for services, a gallery, and testimonials. This theme is quick to install and straightforward to use. Included with it are icons, background images, fonts, and custom widgets. ForceAir works well on tablets and mobile devices. This theme is named JohnnyGO, and it's sold by TemplateMonster. What's amazing about JohnnyGO is that it comes with 15 different themes, including 2 for A/C specialists, as well as themes for plumbers, handymen, and more. JohnnyGO is a great for a HVAC company because it includes all of the components you need, including booking and appointment forms, services, and a project management system. This theme is clean and extensible, and it's very highly reviewed. The major features of JohnnyGO include: it includes plugins, has map integration, supports WooCommerce, and includes multiple layouts. Some of the things that come with JohnnyGO are icons, fonts, and custom widgets. The drawback of JohnnyGO is that it is not free. 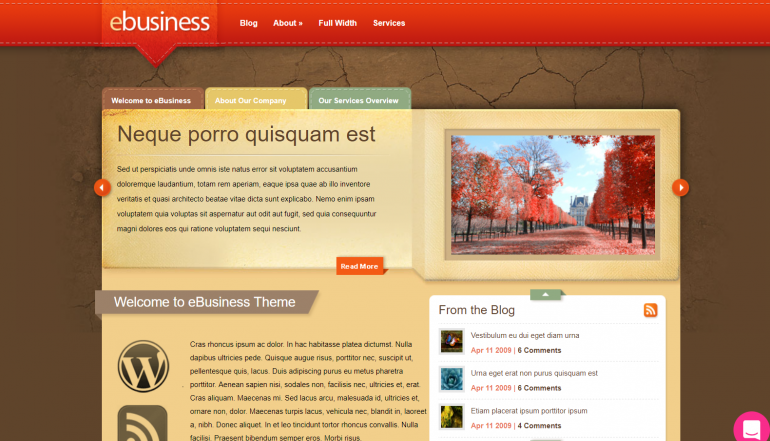 Nevertheless, this theme is a professional option for your website. This theme is called Technico, and it is offered by CSSIgniter. Technico is a well suited for a HVAC company because it contains widgets for srevices, team, testimonials, and more. We chose Technico because it is colorful and clean. Top features of Technico are that it includes plugins, has many customization options, is SEO optimized, has a drag and drop builder, has a 1-click install process, offers multiple color choices, and offers free suppport. Additional stuff included with this theme are icons, background images, fonts, custom widgets, and demos. This theme is easy to install and a snap to use. Technico works well on tablets and mobile devices. 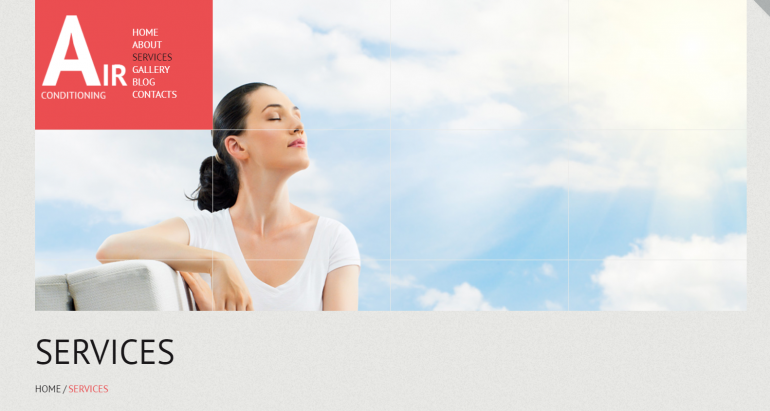 FreshAir is a clean and uncluttered theme by Themeforest. In addition to being colorful, FreshAir is one of our favorite themes because it provides built in search, has many customization options, is SEO optimized, has a drag and drop builder, has a 1-click install process, offers multiple color choices, integrates with social media, offers free suppport, and includes multiple layouts. FreshAir is a well suited for a HVAC company because it includes all of the components you need, including scheduling, services, and a gallery of testimonials. FreshAir enjoys a large user base, so it is easy to obtain help and support. This theme is a breeze to set up and painless to use. Included with FreshAir are icons, fonts, and custom widgets. FreshAir works well on tablets and mobile devices. It is also multilingual. Although it is has many options, making configuration complicated, we love this theme because it is gorgeous looking, and among users, it's very highly reviewed. It will definitely look attractive on your site. 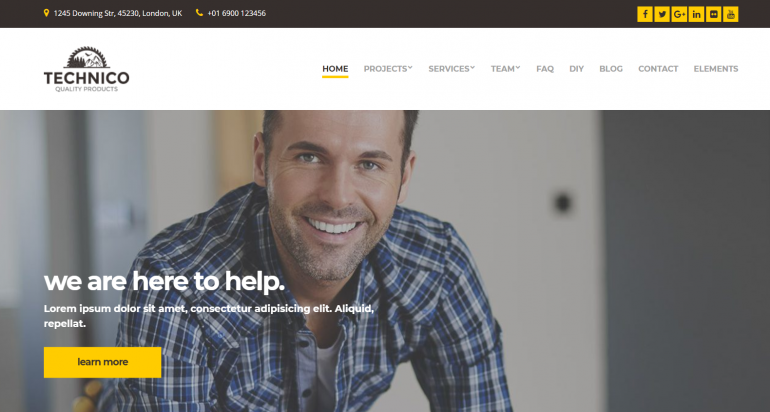 Unlike other themes in this roundup, eBusiness from Elegant Themes isn't just for HVAC companies or even contractors. eBusiness is a more general theme that works well for an HVAC company. eBusiness is high quality and fun. The most significant features of eBusiness are that it includes plugins, has many customization options, is SEO optimized, has a drag and drop builder, is skinable, offers free suppport, and includes multiple layouts. Some of the things that come with eBusiness are icons, background images, fonts, custom widgets, and demos. This theme is a breeze to install and a snap to use. eBusiness looks great on mobile. It is also multilingual. Like the themes above, but don't think they are unique enough for your HVAC business? A top rated developer on Fiverr will customize any of the themes above to suit you (as well as upload content, install plugins, and more) starting at $50.